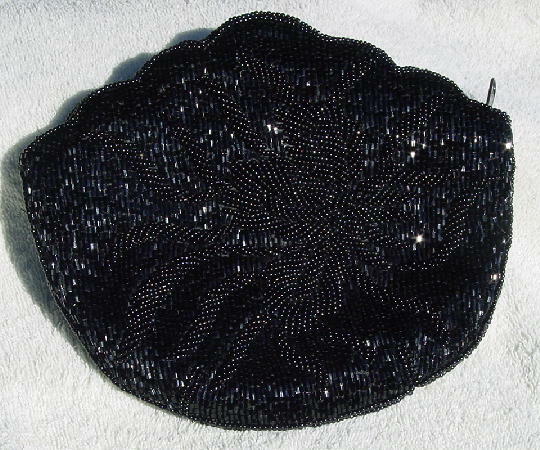 This vintage black beaded evening clutch is by Andre Cellini and was handmade. We don't know which country because the tag has been cut. It has a scalloped edge top and a rounded bottom. There is a top side to side zipper, a lightly padded black fabric lining, and an open interior pocket. 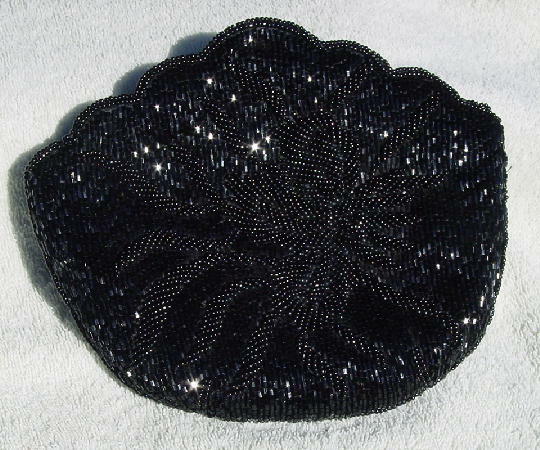 It has the same design on both sides - a background of black (somewhat iridescent) elongated beads and an elevated freeform flower and leaf design in tiny round beads. It has two rows of the same tiny round beads going around all the exterior edges. There is some weight to it because of all the beading. It was her evening purse when she modeled in Paris and Milan.